The Ratchet & Clank games have always been a favorite of mine since the dynamic duo’s debut back on the PlayStation 2. I wouldn’t call myself a fanboy of the series, but I just want you to know that I really, really like Ratchet & Clank. Insomniac’s latest installment in the series, simply entitled Ratchet & Clank, is a reimagining of the original PS2 classic that follows a similar storyline, features a familiar arsenal of weaponry, and visits to some memorable locations that fans of the series will be sure to recognize, though people just starting out with the series will surely enjoy all of these as well. This Ratchet & Clank is far from a remaster and is certainly nothing like the HD trilogy that we were welcomed with on the PlayStation 3. The easiest way I can think to describe this installment in the series is that it’s simply a marrying of everything great about the duo’s original outing paired up with an all new Ratchet & Clank experience. This is a reimagining of the franchise for a new generation, a new audience and, while feeling familiar to the original game, breathes new life into the series. Hopefully, this will help revitalize the series and start to bring back platformers to a generation overcrowded by first-person shooters. If you’re at all familiar with the Ratchet & Clank formula you’ll feel right at home with this one. If you have never heard about Ratchet & Clank before, and you think that this just sounds like some sort of estate agency, let me just go ahead and explain what Ratchet & Clank is and I’m sure that I’ll have your attention. Ratchet & Clank is a platforming series that has a strong focus on using an arsenal of ridiculous weaponry (Ahem, Tools of Destruction, anyone?) to defeat the hordes of enemies that you are bound to encounter, as well as using an array of unique gadgets to assist you in solving puzzles, finding secrets, and traversing the many environments that the series has to offer. 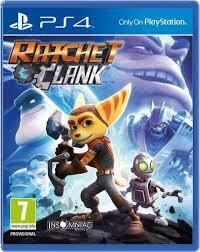 Throughout the Ratchet & Clank series you take control of a Lombax named Ratchet and a smart little robot named Clank. Ratchet is a character who kind of looks a little bit like Timon from The Lion King and who has a strong admiration for explosions. Clank travels alongside Ratchet by riding on his back and doubling up as a gadget with the ability to allow the pair to pass over large gaps by turning both of his arms into helicopter blades and ejecting another from his head. The main thing that has always kept me coming back to the Ratchet & Clank series has always been that arsenal of weapons that I previously mentioned. Each game has a metaphorical ton of new weapons to choose from and there was always a large number of ways that I could go about erasing my enemies from existence. Even though this installment is a reimagining-reboot-remake, it is certainly no exception. The weapons in this game mostly consist of weapons that have been in previous iterations of the series. This doesn’t make the weapon variety feel lazy, but I would have preferred if they had focused on sticking to including all of the original Ratchet weapons. That being said, I guess this is a reimagining and I shouldn’t really complain as the weapons included in this game are all fantastic. Ranging from the Pixelizer, a shotgun-like weapon that turns your foes into pixelized versions of themselves, to the Groovitron, a disco ball that is thrown into a group of enemies that causes them dance uncontrollably, rendering them vulnerable to attacks from other weapons at your disposal. Like I said, most of the weapons at hand in this Ratchet adventure have been in previous installments, which acts as a nice bit of fan service to long-time fans of the series, but I couldn’t help but be bothered by the lack of new weapons. The Pixelizer and the Proton Drum were the only two weapons that haven’t been in a Ratchet game before. This would have been fine if I wasn’t so used to having a vast array of new weaponry every time a new Ratchet game rolls around, showing off the creativity of the weapon fanatics over at Insomniac – only a minor complaint, but I still would’ve loved to see either the original Ratchet weapons reimagined, or an entirely new cast of weapons all together. The gadgets in Ratchet & Clank are made up of various tools to assist the duo in their adventures. The Magneboots, for example, are used to traverse magnetic surfaces, and the Box Breaker allows Ratchet to break all of the surrounding boxes and release the collectible bolts within them by smacking the floor with his Omniwrench 8000, a gigantic wrench that he can hit enemies and open doors with. Oh yeah! That’s something I should probably mention – in order to purchase more weapons to further develop your weapons you need to accumulate various quantities of bolts. Now, you probably won’t have too much of a hard time collecting bolts as you get them for destroying just about anything. This is a good thing, since you’ll spend the majority of your time destroying everything in sight (and everything out of sight if your aim isn’t very good). Bolts are just one of the types of currencies found in Ratchet & Clank. Another form of currency that you’ll be running into a lot will be that of Raritanium, a mineral-like substance that can be used to upgrade your weapons, and can either be dropped from enemies when defeated or found in mounds around the various planets when exploring. You can upgrade just about every aspect of a weapon when you have enough Raritanium, such as the rate of fire, the amount of bolts an enemy drops when they’re defeated, and how big the blast radius of an explosion is. Y’know, all the good assets that make destruction more destructive. One thing that can’t be ignored when it comes to this installment of the Ratchet & Clank series is just how jaw-droppingly good it looks; it looks so good it could easily be mistaken for a Pixar film. Almost every aspect of this game looks just about perfect and is concrete proof that games don’t need to have the most realistic looking graphics to look beautiful in this day and age. From the individually visible pieces of fur on Ratchet’s ears to the colors of the environment reflecting off of Clank, just about everything in this game looks absolutely gorgeous. The only problem I encountered with the graphics was that I would occasionally run into boxes clipping in and out of existence whenever I dragged the camera a little bit too close to one, though in most cases I’d already smashed the boxes before this even happened. A minor flaw, but nothing that takes away from the experience that the game’s visuals have to offer. My only real gripe with Ratchet & Clank is the interactions that the two main characters have with each other. In past adventures, the dynamic duo have been just that – a dynamic duo, whereas in this game it feels more like Ratchet is the star of the show and Clank is just his sidekick, which I wouldn’t mind if I wasn’t already aware of the rich friendship the pair share in previous titles. One of my absolute favorite parts of this game that, in my opinion, just completely separates this game from the original is the narrative. Though it follows a similar story to the original PS2 game, this time the story is told through the voice of the galaxy’s worst super hero: none other than Captain Quark. Like everything else about Quark, this version of the Ratchet & Clank origin story is completely over-exaggerated to the point of ridiculousness. Almost everything you do throughout the game is narrated. Almost drowned whilst swimming? Quark will have something to say about that. Defeat a large quantity of Sand Sharks by throwing your wrench at them? Quark will probably have something to say about that. It’s just something that adds another page of humor to an already hilarious franchise, and it’s a unique version of storytelling that I don’t think I’ve ever seen in a video game before. I mean, I probably have, but I honestly can’t think of anything off of the top of my head. Ratchet & Clank for the PS4 is an absolutely outstanding game in an already fantastic series, and this particular installment is a true testament that shows just how viable platformers are in today’s video game market. Even with titles such as Uncharted 4 just around the corner, Ratchet & Clank simply shouldn’t be overlooked. It’s a truly fantastic adventure that gamers young and old can both equally appreciate. If you’re a veteran of the series, or it’s a franchise that you want to start dabbling in, I highly recommend picking Ratchet & Clank up and at the asking price of just $39.99/£34.99, it’s pretty hard to give it a pass. Oh, and if you were wondering: Clank doesn’t look anything like Pumbaa. Just saying. Hailing from Brighton, Harry Martin, also known as Polylink, has had a strong passion for video games for as long as he can remember. When he's not writing, Harry will most likely be found to be perfecting his skills in Super Smash Bros. Melee, listening to records or walking backwards across Hyrule Field. His favourite game is, has always been and forever will be Spyro the Dragon 2: Gateway to Glimmer on the PlayStation. One of his proudest gaming achievements is completing Spyro 2 100% twice in a single day, something that he's probably far too proud of.